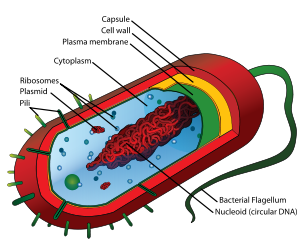 Around the outside of the cell membrane is the bacterial cell wall. 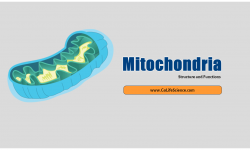 Bacterial cell walls are made of peptidoglycan (also called murein), which is made from polysaccharide chains cross-linked by unusual peptides containing D-amino acids. Bacterial cell walls are different from the cell walls of plants and fungi which are made of cellulose and chitin, respectively.The cell wall of bacteria is also distinct from that of Archaea, which do not contain peptidoglycan. The cell wall is essential to the survival of many bacteria, although L-form bacteria can be produced in the laboratory that lack a cell wall. The antibiotic penicillin is able to kill bacteria by preventing the cross-linking of peptidoglycan and this causes the cell wall to weaken and lyse. The lysozyme enzyme can also damage bacterial cell walls. A second type of archaeal cell wall is found in Methanosarcina and Halococcus. This type of cell wall is composed entirely of a thick layer of polysaccharides, which may be sulfated in the case of Halococcus. Structure in this type of wall is complex and as yet is not fully investigated.